Go to original pattern for design DROPS 98-43. 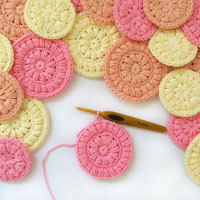 DROPS circular needle and double pointed needles size 9 mm / US 13 or size needed to obtain the correct gauge. 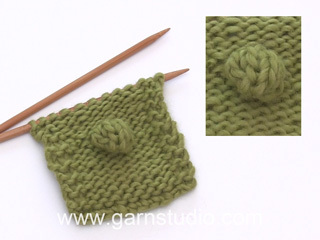 Knitting gauge: 10 sts x 14 rows on needle size 9 mm / US 13 in stockinette sts = 10 x 10 cm / 4'' x 4''. 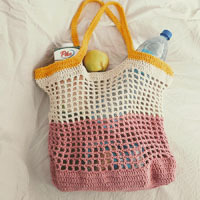 You can get the yarn to make this pattern from	25.65$. Read more. 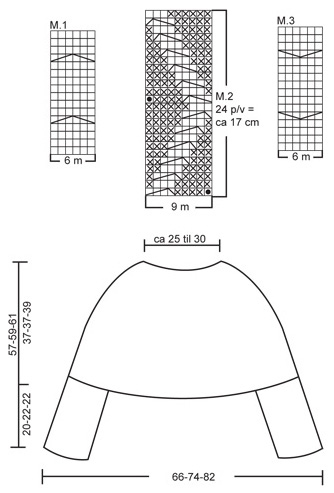 Pattern: See diagram M.1 The diagram is seen from the right side. 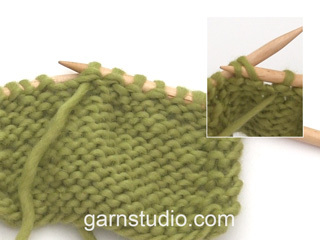 The cape is worked in the round on circular needle from the bottom edge towards the top. Cast on 140-156-172 sts on circular needle size 9 mm / US 13 with Eskimo. K 1 round, P 1 round and K 1 round. Size S/M: P10, K3 (= mid left sleeve/shoulder), P10, K3, P4, diagram M.1 (= 6 sts), P6, diagram M.2 (= 9 sts), P6, diagram M.3 (= 6 sts), P4, K3, P10, K3 (= mid right sleeve/shoulder), P10, K3, P4, diagram M.1 (= 6 sts), P6, diagram M.2 (= 9 sts), P6, diagram M.3 (= 6 sts), P4, K3. Continue pattern like this. Size L/XL: P10, K3 (= mid left sleeve/shoulder), P10, K3, P6, diagram M.1 (= 6 sts), P8, diagram M.2 (= 9 sts), P8, diagram M.3 (= 6 sts), P6, K3, P10, K3 (= mid right sleeve/shoulder), P10, K3, P6, diagram M.1 (= 6 sts), P8, diagram M.2 (= 9 sts), P8, diagram M.3 (= 6 sts), P6, K3. Continue pattern like this. Size XXL: P10, K3 (= mid left sleeve/shoulder), P10, K3, P8, diagram M.1 (= 6 sts), P10, diagram M.2 (= 9 sts), P10, diagram M.3 (= 6 sts), P8, K3, P10, K3 (= mid right sleeve/shoulder), P10, K3, P8, diagram M.1 (= 6 sts), P10, diagram M.2 (= 9 sts), P10, diagram M.3 (= 6 sts), P8, K3. Continue pattern like this. When piece measures 30-30-31 cm / 11 3/4"-11 3/4"-12 1/4" beg dec for shoulder/neck. In each P section with P10 (in size XXL only the P10 sections on sleeve/shoulder) dec 1 st on every other round a total of 5 times. At the same time dec 1 st in each P section with 4-6-8 P on every third row a total of 2-2-4 times. At the same time dec 1 st in each P section with 6-8-10 P (i.e. P sections between M.1 and M.2 and between M.2 and M.3) on every other row a total of 2-4-5 times. After all dec are complete = 104-112-116 sts on round. Knit 1 round, at the same time dec evenly to 56-63-70 sts. Piece measures approx 37-37-39 cm / 14½"-14½"-15 1/4". P 1 round, K 1 round. Continue in Rib, K3/P4 - make sure there is K3 mid front. 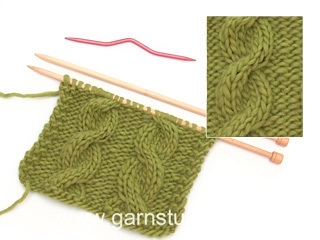 When neck measures approx 15-15-16 cm / 6"-6-"6 1/4" bind off loosely in Rib. 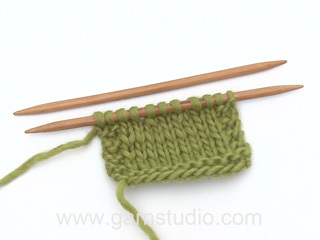 Cast on 35-35-41 sts on double pointed needles size 9 mm / US 13 with Eskimo. Insert a marker at beg of round = mid under arm. K 1 round, P 1 round and K 1 round (= lower sleeve edge). Size S/M + Size L/XL: P2, *K3, P4*, repeat from *-* and finish with K3, P2. Size XXL: P3, *K3, P5*, repeat from *-* and finish with K3 and P3. When piece measures 20-22-22 cm / 8"-8 3/4"-8 3/4" bind off loosely in Rib. Sew a sleeve to each side of the cape in the outer loops of sts. Leave 12-12-18 sts (i.e. 6-6-9 sts on each side of the marker) un-sewn. Make sure to match K3 on sleeve with K3 on the shoulder piece. = Bobble: K1, I yo, K1, I yo, K1 in the same st (= 5 sts). Turn. Work 4 rows stockinette sts over these 5 sts. Now lift 2nd st on right needle over first st, 3rd st over first st, 4th st over first st and 5th st over first st = 1 st left. = Put 1 st on cable needle behind piece, K3, P1 from cable needle. Nach allen Abnahmen sind noch 104-112-116 M. übrig. 1 R. re. stricken und gleichzeitig, gleichmässig verteilt 56-63-70 M. abn. 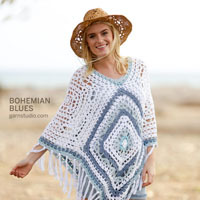 Dear Mrs Mervat, this poncho has been written for a tension of 10 sts x 14 rows = 10 x 10 cm. I would recommand you to use our search engine to find a pattern matching your tension. Happy knitting! In diesem Diagramm sind alle Reihen gezeichnet. Sehr schöner Poncho, den ich gerne nachstricken möchte. Ich frage mich nur, wie die Strickschrift zu lesen ist. Von Socken kenne ich es, dass nur die ungeraden angegeben sind, in den geraden strickt man die Maschen wie sie erscheinen. Wie ist das hier? Jede Reihe wie in der Grafik (also jeweils anders) oder immer zwei Reihen gleich? Wenn das nicht stimmt, geht es schief...... Danke im Voraus und alles Gute fürs Neue Jahr!